How can we expect the International Community to intervene when we are not prepared to accept our faults and jump at them when certain mistakes are pointed out by them. On such occasion it should be left to the Government to deal with them rather than others coming out with condemning statements. Only by doing so good-will can be maintained with all foreign countries. This applies to foreign agencies as well. The annoyance is often caused by unconcerned parties and the silence maintained by the Diplomatic Community at times is understandable. The International Community has done a lot to keep the LTTE operating in their respective countries, under strict check and constant vigilance. (June 08, Colombo, Sri Lanka Guardian) The Tamil United Liberation Front very strongly condemns the LTTE for causing the death of 22 innocent civilians and also for causing grievous injuries to over sixty others by targeting a crowded bus – with a claymore mine. This is the third major incident in a week and the sixth in one month, taking a toll of 112 lives and injuring over 348 innocent people. How many more such incidents will take place God only knows? This is obviously the work of a fanatical group claiming to be waging a war to liberate the Tamils, little realising that the Tamils themselves need to be liberated from them. If these brutes do not tame themselves they will have to be tamed by others. This type of atrocious activities cannot be met with all the fire power the Government Forces have. It is not a conventional war that the LTTE is fighting. They are now cowardly engaged in gorilla warfare. Only the International Community can now rescue the country from the atrocities of the LTTE, but it is the Government’s responsibility to pave the way for it. Under the present circumstances the International Community, Indiain particular can’t do anything other than silently and helplessly watching all what is happening. Only last week I appealed to the Government to come out with a reasonable proposal, acceptable to the International Community not out of fear for the LTTE , but to enable the International Community to step in and to tell the LTTE to stop all their brutal killings of the innocent civilians. Diplomatic Community at times is understandable. The International Community has done a lot to keep the LTTE operating in their respective countries, under strict check and constant vigilance. Everyone knows that the main demand of the LTTE is division of the country and that demand is serious enough for anyone to worry about. The ultra-nationalist, in particular, should appreciate the Tamil Leadership for openly opposing separation, defying the LTTE and at grave risk to their lives. They have declared that they will be satisfied with a reasonable and an acceptable solution within a United Sri Lanka but not within a UnitaryStateunder which there is no guarantee that whatever provisions made in a Unitary Constitution will remain in the Statute book for ever. The fate of the Soulbury Constitution should not be-fall on the proposed new constitution, leaving room for further agitation in the future. Whatever solution arrived at should be the last and final one that will strongly unite all sections of the people of Sri Lankato a common identity as Sri Lankans, to live in peace and amity, enjoying all rights equally with others. This is the only way to bring back peace and save the country from further destructions of life and property. We have lost enough and cannot afford to lose anything more. Another important factor that the ultra-nationalist have failed to take into consideration and should take as an Incentive to soften their stance, is the acceptance of Buddhism virtually by all Sri Lankans, as the state religion of Sri Lanka. The ultra-nationalist should therefore be magnanimous enough to give-in to the aspirations of the minorities who want to live in a United Sri Lanka as equals along with the others. The ethnic problem has become so acute that everyone should do a complete re-thinking of their stand. 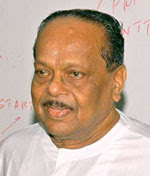 This is the time for all political parties and various groups to shed their differences and to agree on a reasonable proposal that will satisfy the minorities and the International Community which if satisfied will certainly compel the LTTE to shun violence and to accept the solution recommended by them. They can, if necessary, impose several sanctions and curtail their activities in various countries including collection of funds and purchase of arms. The political parties should now get together and agree to a solution based either on the Oslo Declaration or by adopting the Indian Model if the terms “Federal” and “Unitary” are allergic to any section of the people. I strongly urge His Excellency the President Mahinda Rajapakse, Leader of the SLFP and the Leader of the Opposition and President of the UNP Hon. Ranil Wickremesinghe to take the initiative without any delay to find a solution for the ethnic problem. The participation of the International Community cannot be construed as their interfering in the internal affairs of Sri Lanka. I am asking them only if satisfied, to recommend to the minorities as reasonable any solution that will emerge out of the initiative taken by these two leaders. Everyone should realise that most of the people who die everyday are innocent bread-winners of poor families. Each one of us has a sacred duty to help to end the war and bring back much needed peace, for our people to live without fear and tension and to move about freely and fearlessly. I thank the Sinhalese Civilians in the south and appreciate the tolerance hitherto shown by them inspite of the various provocations deliberately given by the LTTE. The reasons for enhancing their vicious activities recently are obvious and I strongly urge the Sinhalese to continue to show extreme tolerance and not to get provoked under any circumstances. I call upon all, be they Sinhalese, Tamils or Muslims to help the authorities to trace the people engaged in terrorist activities. The Tamils and the Muslims of the Batticaloa District should learn from the Sinhalese in the South as to how they are showing extreme tolerance inspite of the numerous daily provocations given to them by the LTTE. I appeal to all the residents in Batticaloa to maintain Peace and harmony and allow the others to live peacefully free from constant fear and tension.